There are 4 posts in this thread, and it has been viewed 5767 times. Bermuda Triangle. What do you think of it? 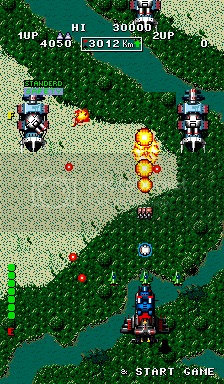 After some quite successful Arcade shooters like Vanguard I and II , HAL 21 or Alpha Mission 1, SNK Corporation released Bermuda Triangle in 1987 and remained faithful to the genre. Recently Bermuda Triangle has been re-released on 'SNK Arcade Classics Vol. 0' for the PSP and as Minis at Playstation Network, so there's no excuse for not getting it for lousy $3. 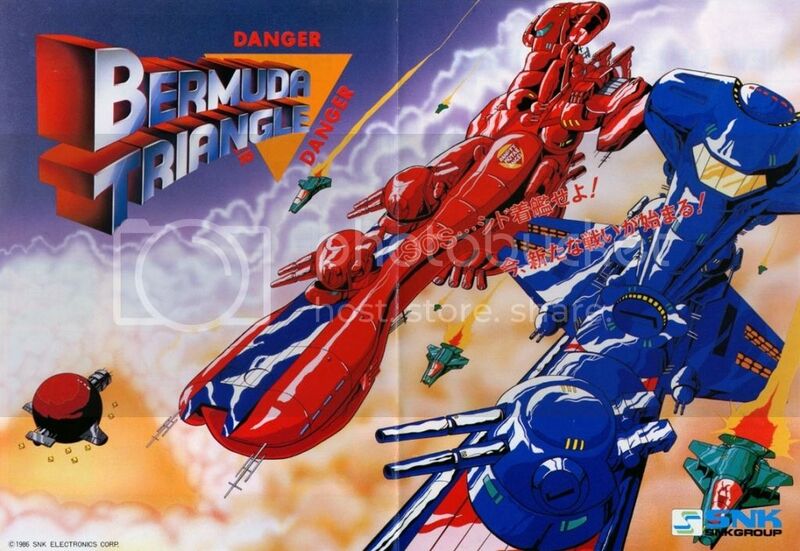 Bermuda Triangle is a vertical-scrolling forward and backward shooter realeased by SNK Corporation in 1987. 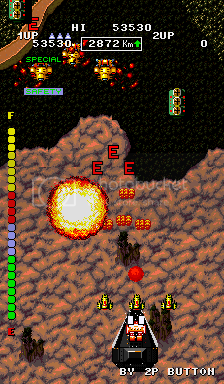 You control a giant fighter jet and shoot enemies, collect power-ups and defeat bosses to advance levels. One mentionable feature of Bermuda Triangle is that at the end of each stage the screen starts to scroll backwards, what makes the gameplay way trickier. 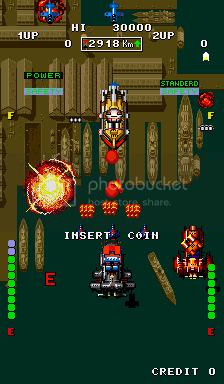 The game uses rotary-style joysticks to control the ships turret (like those used in Ikari Warriors). 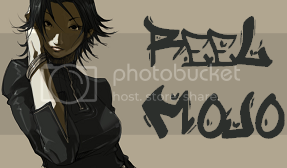 I for one think this title deserves more credit than it's ever gotten for the most part. As you'll read about in the description of the game it starts out like many other vertical shooters however it starts getting a little interesting with the power-ups you receive. Each one morphs your ship into a different form while playing it's hard to distinguish exactly what it changes into because if you advert your eyes too long it's all over my friends. Secondly there are tiny mini helpers of shorts you can collect to spread your shots out not all that different right? However, you can adjust the position of these and that alone can help or hurt your progress. My first play through was a pretty wild experience. I thought I was nearing the boss at the end of the stage and thought to myself..."well no big deal here" then I started moving backwards...I was a little shocked and confused at the same time hahahahaha! All the while shooting enemies that were out to pay you back for your first trip through while avoiding strategically placed orbs in patterns to ensure your demise...so essentially as long as ya can go through the level three times avoiding swarms of enemies then defeat the boss in tact your good to go. One of the best shooters I've ever played hands down. dodge shots and enemies. Having some speech in the game is a nice touch. Overall the game does feel quite average. Not a bad effort from SNK but nothing special. Hopefully more people will give this a try and post their impressions of the game here. This game is currently free for Playstation Plus members, so I gave it a go last night for the first time. There's so many great ideas going on in this game that I can't even begin to understand why I had never heard of it before it was GOTW. This should be talked about right alongside Ikari Warriors as one of the best SNK games from the pre-NeoGeo era. It's nice to pilot a giant ship for a change because it makes you feel like you're unstoppable, even if the odds are still very much stacked against you. You're not going to dodge every bullet and the game is designed with that in mind which makes it a very different experience from every other scrolling shooter I've ever played. The levels are very cleverly designed and can be extremely intense, especially when flying backwards.